Wright chose to locate the house on the high ridge line atop the steep ravine, orienting the house to take advantage of the views of the St. Joseph River. Since the house is located at the end of a cul-de-sac, the Mr. Schultz was concerned that street parking would be inadequate as they liked to entertain and “..too many of our friends own cars..”. 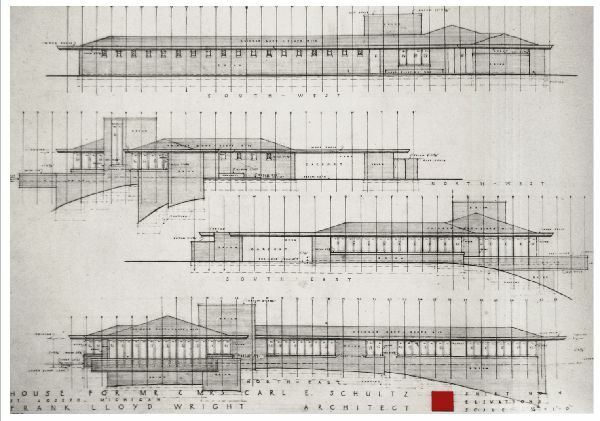 Wright accommodated the owners request by incorporating an enlarged gravel “forecourt”, which was later paved. 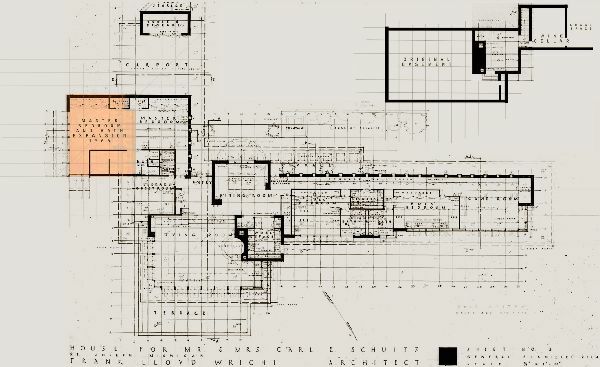 The original house plans show Wright’s preferred smaller basement and the beginnings of a fountain design anchoring the front patio screen wall. The house was laid out on a 4’ x 4’ rectangular grid. The house “as-built” has a lower basement located under the Living Room, which was requested by Mr. Schultz to accommodate his ping-pong table. A Wine Cellar was enclosed in the crawl space area, which, due to the extreme drop in grade, soars to over 12’ in height in spots. Per the owners request, a “furniture” partition sub-divides the boy’s bedroom. The fountain in the patio became a planter. 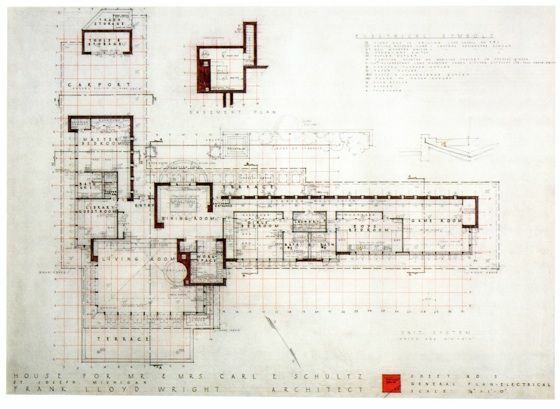 The house was completed in the summer of 1959, a few months after Wright’s death in April. In 1963, Carl Schultz commissioned Taliesin Architects to design a house for his daughter and son-in-law on a neighboring parcel. Three years later, Taliesin Architects also designed an addition to his house doubling the size of the Master Bedroom and Master Bath. The “L” shaped facade includes a carport on the right and the long bedroom wing on the left. The entry door is tucked back at the intersection of the two wings and is flanked by two geometrically designed perforated windows. Projecting out over the ravine is the living room with deep overhangs and a continuous row of French doors opening onto the cantilevered terrace.The long bedroom wing follows the crest of the ravine emphasizing the horizontal with its continuous band of casement windows. The facade facing the street in much simpler and private with a series of “postage stamp” windows. which is broken up by the dining room picture window, a concession by Wright per request of the owners. The low hipped roof is set back from the very deep overhangs along the perimeter of the house.The house was built from recycled paver bricks and features Philippine Mahogany fascia with a continuous perforated circle design.